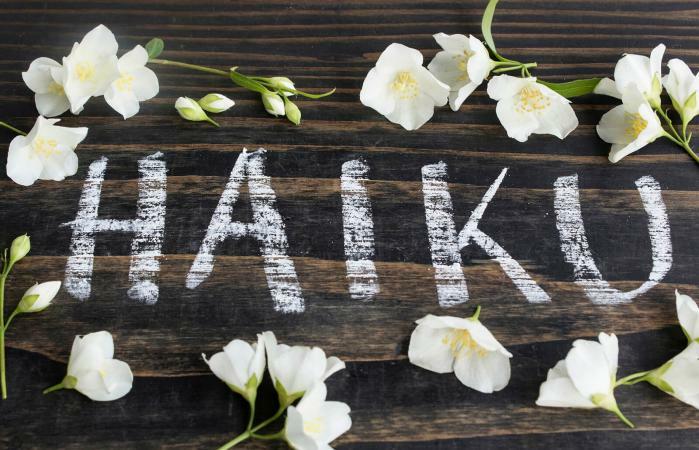 Haiku is a Japanese form of poetry that evolved out of an earlier form of Japanese poetry called tanka. Tanka was typically written by two poets, with one writing the first three lines and another writing the final two lines of a 5-7-5-7-7 poem. Haiku evolved as a poetic form in its own right in the 18th century. It retained the initial 5-7-5 form of the first three lines of tanka and dropped the final two lines. Traditionally, the theme of a haiku poem dealt with the seasons and aimed to create an eternal moment when man and nature become presented in a unified whole, free from the bounds of space and time. While creating any work of art is a highly subjective act, having some tips on how to get started can never hurt. In no way, however, should you feel like you have to follow these ideas like they are hard-set rules. They are merely offered to help guide you down a path toward discovering your own process. Haiku is not only a form. A haiku poem takes a particular approach to viewing the world around you. Typically, a haiku refers to nature by calling particular attention to a referent location and/or a season. Three approaches to writing haiku are advocated by the great haiku writers. One is to write haiku about where you physically are at the moment. If you're sitting on a bench in the park, your poem should reflect your physical location. The second is to write from a place of reflection. Thinking back on a place and time in the past, some believe, can deepen one's poetry by allowing the poem to experience the changing effects of time. Finally, some believe that haiku should be completely imagined and not based on one's literal experiences. Of course, experimenting with all three methods is highly recommended. A haiku is a short form of poetry. One idea to keep in mind when you compose is that you should be able to read your finished poem in a single breath. This approach helps to focus your writing on a single emotion that can be expressed without laborious effort. Haiku poems are typically divided into two parts. Try to create a break between either the first line and the second line or the second line and the third line. This can be accomplished with punctuation or a focused use of language that conveys a stop or a break. You can then relate the two parts of the poem to each other using techniques like comparison, contrast, double meaning, metaphor, paradox, etc. While the standard form of haiku is 5-7-5, some writers in the west like to shorten the poem even more to a 3-5-3 form. Experiment with both, and see which proves to be the most successful to you. Sometimes the best inspiration comes from reading the work of other poets. The following books feature the haiku of master poets.